In 1544, Henry VIII led the largest army then ever raised by an English monarch to invade France. This book investigates the consequences of this action by examining the devastating impact of warfare on the native population, the methods the English used to impose their rule on the region (from the use of cartography to the construction of fortifications), as well as the development of English colonial rule in France. As Murphy explores the significance of this major financial and military commitment by the Tudor monarchy, he situates the developments within the wider context of English actions in Ireland and Scotland during the mid-sixteenth century. 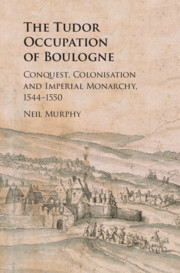 Rather than consider the plantations established in the mid-sixteenth century Ireland as the 'laboratory' for a new form of empire, this book argues that they should be viewed along with the Boulogne venture as the English crown's final attempt to establish colonies through the use of state resources alone. 1. The conquest of Boulogne and the history of Tudor England; 2. Violence and the campaign of 1544-46; 3. Conquest, cartography and treaty; 4. The settlement of the Boulonnais; 5. The Boulogne garrison; 6. The Tudor occupation of Boulogne and English imperialism. Neil Murphy is Associate Professor in History at Northumbria University. He has authored two books, The Captivity of John II, 1356–60: The Royal Image in Later Medieval England and France (2016) and Ceremonial Entries, Municipal Liberties and the Negotiation of Power in Valois France, 1328–1589 (2016) as well as almost twenty articles and chapters. He is the review editor of the journal, Archives.